The greatest silver rush in U.S. history didn't happen because of a strike in a mine shaft —it happened in Washington, D.C., right across the street from the White House. It was the release of the U.S. Treasury Hoard from 1961 to 1964, and for coin collectors, it was every bit as exciting and important as the California Gold Rush of 1849! Nearly 500 million Morgan Dollars and Peace Dollars were known to exist in the late 1950s. Approximately half were in the hands of the public, and many rested in the vaults of banks and the Mints. Over 200 million were stored in 60-pound bags containing 1,000 coins each in U.S. Treasury vaults in Washington, D.C. The coins were waiting for release, and it came in an epic fashion in the early 1960s! To discover how the coin rooms in the U.S. Treasury in Washington, D.C. became overflowing with bags and bags of silver dollars, one must go back to over a century ago. With the passage of the Bland-Allison Act in 1878, Morgan Silver Dollars — named for designer George T. Morgan — began pouring out of the U.S. Mints in Carson City, Philadelphia, New Orleans and San Francisco. The Bland-Allison Act directed the Mints to strike silver dollars using silver from the famous Comstock Lode, but by 1893 there was little demand for silver dollars. Most Americans preferred paper money instead of carrying around heavy silver dollars, so Mint bags starting piling up in storage. U.S. Mints were stuffed to overflowing and what to do with the dollars was becoming a major issue. Morgan Silver Dollars continued to be minted until 1904, when the Comstock Lode was finally exhausted. By this time, most of the coins were shipped from the Mints to the Treasury Building in Washington. In 1918, Congress passed the Pittman Act to replenish the government's reserves of silver bullion by melting millions of Morgan Silver Dollars in the Treasury vaults. As a result, over 270 million Morgan Silver Dollars were melted — almost half the entire mintage from 1878 to 1904. The dollars melted under the Pittman Act substantially reduced the availability of many of the dates minted from 1900 to 1904. Since these dates were the last coins placed in the Treasury, they were the first to be taken from the vaults. 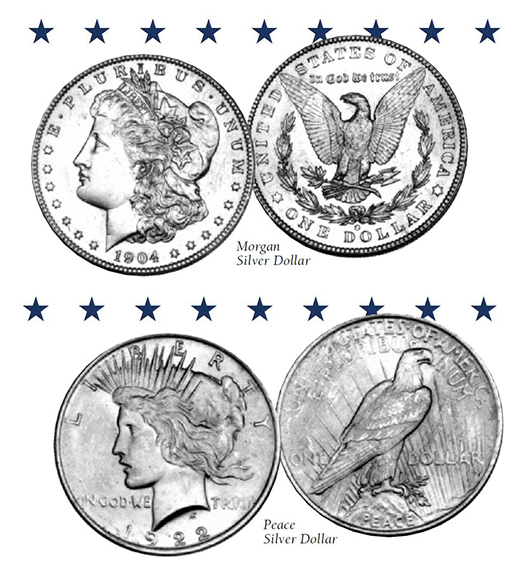 The Pittman Act also required the government to purchase more silver to replace the melted coins, so the Morgan Silver Dollar was briefly revived in 1921. It was replaced later in the year with the Peace Silver Dollar, which celebrated world peace after World War I. The Peace Silver Dollar was minted every year until 1928, when the silver supply ran out again. Small numbers of Peace Silver Dollars were also issued in 1934 and 1935. Meanwhile a small trickle of coins in the 1930s and 1940s flowed out of the U.S. Treasury cash room into the hands of collectors. That trickle turned into a flood in the late 1950s and early 1960s. From 1958 to 1960 nearly 58 million silver dollars were released by the Treasury. This figure jumped to 31 million alone in 1963, and in the first three months of 1964, more than 25 million silver dollars were drawn from Treasury vaults! At this point, the doors to the vaults were officially closed. When news spread that the Treasury was selling off its vast hoard of silver dollars at face value, coin collectors from all over the nation swarmed to Washington for a raid on the dwindling supply in hopes of finding scarce dates and Mint marks. Collectors lined up for blocks around the Treasury Building and jammed its corridors and cash room. "Prospectors" with their newly acquired dollars sprawled into any available space, using benches, chairs and window sills to quickly sort through their dollars. Sorting even went on in the washrooms. Reminiscent of the old Western gold rush days, rumors of "finds" spread like wildfire. One popular rumor was that someone had purchased a 1,000-coin bag containing Morgans bearing valuable dates and mint marks for $1,000 and then turned around and sold it to a dealer for $75,000! Side businesses sprang up amid the circus-like atmosphere outside the Treasury. Four college students, with the consent of the crowd, began to enforce some sense of discipline by making all arrivals sign lists, and issuing slips with place numbers on them. In the pre-dawn hours before the Treasury opened each morning, low-numbered slips were selling for as much as $75. Despite this attempt at discipline, the usual decorum of the Treasury was seemingly shattered. Sidewalk campers, line crashers, littering and noisy haggling among those willing to part with their purchases on the Treasury steps in return for a quick profit from another even more eager collector finally prompted the Treasury to put an end to the silver dollar sales. The end officially came on March 26, 1964, when, as described by The Wall Street Journal, "Treasury Secretary Douglas C. Dillon drove the money changers out of his temple." According to Treasury Department officials, it was clear that the distribution of dollars was not occurring in a very dignified way. The end drew a cry of frustration from collectors. The sales were stopped with 2,900,000 silver dollars left at the bottom of the Treasury's vaults. The end brought a frantic surge in buying from those who had just bought and the line became a frenzied outdoor marketplace. The remaining coins of the hoard were auctioned off in five sales starting in October, 1972, after Congress passed legislation in 1970 to sell the coins. Handled by the U.S.’ Government Services Administration, coins sold at this auction were known as the “GSA” Hoard. 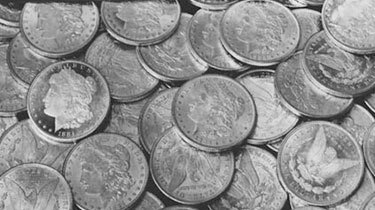 By 1979, all the silver dollars in the hoard were gone.